How many are planning on extreme length's past classic? The more I think about it the more I like it long and the longer it gets the more I like it. I'm almost curious to see how long it will grow. Imagine floor length and beyond that would be so cool, I'm considering it. Just wanted to know everyones thoughts on this? ::raises hand:: Ooh ooh I am! Fingertip length is just a few inches past classic. Then again after getting there, I might change my hair goal. When hair gets super long, it gets to be a matter of "how long do I want my braid to be?". And then, it's like watching your braid grow very slowly. ETA: I think this is how many extreme longhairs end up with such long hair. Braiding, the true length is forgotten, then as the braid grows, the person doesn't notice, and their hair doesn't seem as long or extreme. That's my theory anyway. Completely unrelated to your thread, but .. um. My goal is to first get to a yard. Then to a meter. Then as far past that I can go and still be comfortable and able to care for it. If it does bug me I'm going to cut back to no shorter than a yard. Which is right about tailbone on me. I'm currently at waistband length / hip length. I'll never be above it again by choice. I think the longer your hair gets, the longer you'll want it to get. I agree! I started off wanting it at my shoulders but I never seemed to keep it at that length ! It's at my shoulder-blades and I plan on going as long as it gets. Hellfrozenover your hair looks real nice, I agree with you and Anais and Katja the longer it gets the more length it seems you want. Anyway happy growing. I'm going extreme too...I fear I may not be careful enough because it seems like whenever I get dressed its always in a hurry so I don't detangle as carefully as I should. But I'm going for thigh length, and longer if I'm patient enough and I can keep it looking good at that length (meaning it doesn't look torn up from my constant hurry). Ditto TLSF and Paul. Great hair HFO! Look forward to seeing more pics of your hair as it grows longer. I am going for it. 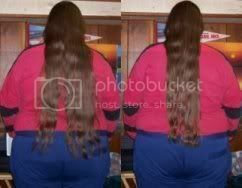 My hair is not that long (mid to upper back) but I used to have it long enough to sit on. I am going for as long as it will get. Amanda, I went to your website. WOW. you have GORGEOUS hair!! At the moment, I just want it somewhere around my waist. This is more of a short term goal, though. For long term I plan on around my fingertips. It depends on how heavy it gets. If I keep it layered somewhat, I can go longer. Otherwise,it is just to thick and heavy. At the moment it is at 32 1/2 falling half a few inches below BSL without pulling.